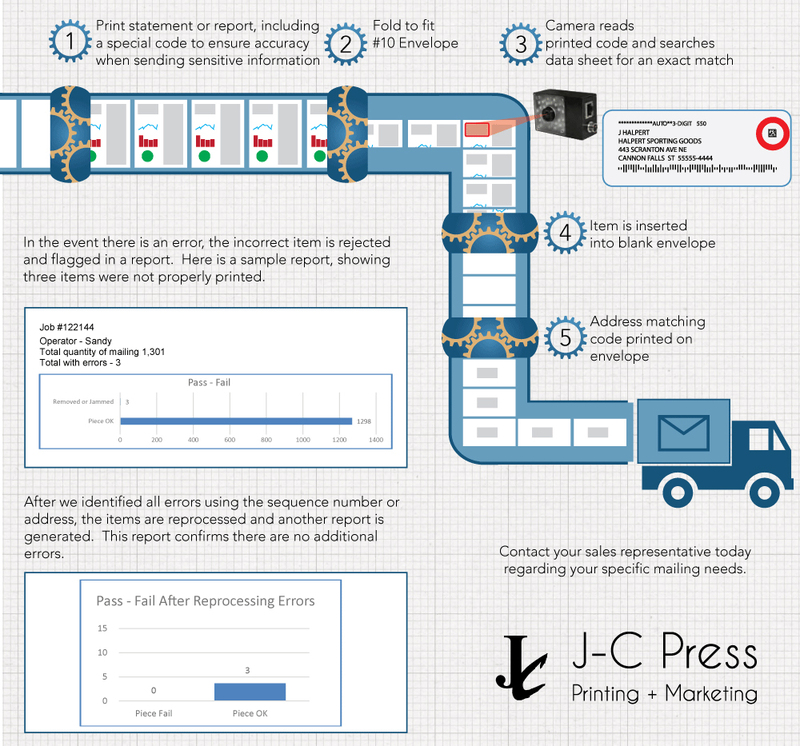 Variable Data is one of the best ways to merge multiple pieces of data into a printed file. We have the expertise to create a simple variable salutation or a complex set of financial statements. Below are examples of how to format a clean database to help ensure a quick and problem-free importation of data to your next variable data project. Learn more on our resource page. If you’re paying non-automation rates, you’re paying too much. We provide postal presorting, and you’re excited to show you how significant the savings can be! Understanding postal requirements for tabbing and folding can be very complex, and we understand how to help you avoid incurring significantly higher mailing costs. When direct mailing without an envelope you need tabbing because folded mail pieces don’t qualify for automation postage prices. Let our experts help in the design stages to provide assistance in meeting postal regulations. If you are a high volume, recurring mailing user, ask us about commingling opportunities. We’ve got the experience and resources to help you take postal presorting to the next level. Worry less about your inventory and more about other aspects of your business. When your supply is low, we alert you. From letterhead or brochures getting low to stress balls or pens, we’ll notify you and get it shipped to you quickly. We assemble multiple parts of your order into one, nice and neat package. We take pride in catering to your requests and ensuring the end product is assembled as requested. We offer climate controlled, secure storage for your printed items. That way you can print the amount you know you’ll eventually use, but only take possession of what you need at the moment. If storage space is in short supply at your office or the nature of your business creates an environment not conducive to properly storing items, you have our protected storage at your service! Sleep easy knowing everything is safe in our secure storage. We work with UPS, FedEx, USPS, and a variety of other carriers to make sure you get the products you need on time. We ship to all 50 states and across the globe.